Are the sadhanas from Pearl Rosary collection the same as those which are used in Jewel Garland of 50 Deities (compiled by Rigzin Chökyi Drakpa (Drikung Dharmakirti))? I'd really like to order the book but don't know if I have the empowerments for it. Also does anybody have a copy of Yangzab Chenrezig that was given by Garchen Rinpoche in May 2016? Yes, most of these sadhanas go with empowerments from the Jewel Garland. Some come directly from the Jewel Garland, some are authored by later teachers but are commonly transmitted together with empowerments from that collection. I think there are exceptions, though -- IIRC, the Jewel Garland doesn't include Vajrasattva or Achi. Thank you, Ratna! Also it seems that the Manjushri is not from 50 deities as the forms in Jewel Garland are different, just according to the picture. Is there some other place where Pearl Rosary could be ordered except for Vajrapub? Thank you, Ratna! Also it seems that the Manjushri is not from 50 deities as the forms in Jewel Garland are different, just according to the picture. No, it's straight out of Jewel Garland. Three peaceful Mañjuśrīs are included in the Jewel Garland: Lord of Speech, White Mañjuśrī from the tradition of Mahāpaṇḍita Mati, and the Nāmasaṃgīti. The first of these is the most commonly taught, together with the sādhana titled the Light of Wisdom (the title of the published text is mistranslated as Wisdom of Light). 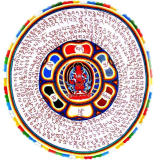 Also, upon checking, I was wrong about Vajrasattva not being included: a sādhana of Vajrasattva is indeed included in the Jewel Garland, although Vajrasattva is not included among the 50 empowerments. I see. I thought that the manjushri in Pearl Rosary is a different form Jewel Garland Manjushris since the picture in the online shop is the "classical" manjushri" with a sword and doesn't look like any of those three if I remember correctly. Do you happen to know which Manjushri sadhana it is?